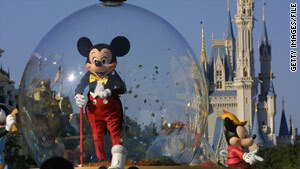 Disney ticket prices for parks in California and Florida are set to go up on Thursday. (CNN) -- It's going to cost vacationers more to visit with Mickey Mouse starting Thursday, when Disney parks in California and Florida will raise ticket prices. Disney posted an announcement about the price hikes Tuesday on its Disney Parks blog. At Walt Disney World in Orlando, Florida, the base price for one-day, one-park passes will rise from $79 to $82 for ages 10 and up. Tickets for children ages 3 to 9 will go from $68 to $74. The additional fee for park-hopper tickets will jump by $2 for one-day access, to $54. One-day, one-park tickets to Southern California's Disneyland Resort will rise from $72 to $76 for ages 10 and up and from $62 to $68 for ages 3 to 9. Prices for one-day park-hopper tickets will go up by $4 for both age groups. Increases will also apply to multi-day passes at both parks. Prices for annual passes will rise by $10 to $18 at Disney World and by $20 for premium annual passes at Disneyland. Prices for tickets and passes already purchased will not be affected. Disney's blog provides links to information about the new pricing, going into effect August 5. Shaquille O'Neal and Justin Bieber....dancin?